Add Wisk with Heart Handle: NoYes (+.35) Design: Wedding CakeHeartBlossombutterflyTreeDiamond RingChinese Love SymbolSea ShellPearCrownPalm TreeLeavesPurseHigh HeelsFlip FlopGolfSnowflakeWedding CoupleTeapotCupLemonade GlassChandelierEiffel TowerCupcakeBirthday CakeGraduationSuits Label Color: WhiteIvoryIvory ChocolateLattePale PinkCandy PinkPink ChocolatesChocolate PinkStrawberry PinkStrawberry ChocolateTangerineChocolateLipstick RedBurgundyLilacPlumPale BlueBlue ChocolateAqua BlueChocolate BlueHoneydew GreenLime GreenChocolate GreenGreen ChocolateLemonGreyBlack Text 1: Text 2: Text 3: Date of Party: This item is currently out of stock! Personalized Bridal Shower Muffin Mixes bake up fresh to let your guest know just how much you appreciate them celebrating with you! Nothing spells lovin' like muffins fresh from the oven! This endearing gift "bakes" a warm and delicious party favor for your guests. Personalization is FREE! Just select from an assortment of pictures to find the Bridal Shower theme design that's just right for you. Then choose the perfect color, add you names, Bridal Shower date, and personal message for a truly custom Bridal Shower Favor that is all your own! 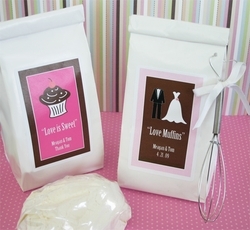 Try labeling your Muffin Mix favors with our favorites such as "Love Muffins" or "Love is Sweet", etc. Create the perfect gift by pairing these personalized muffin mixes with our optional heart handle mini whisk. Our whisks come with a white satin bow and a heart shaped handle! Each white gloss pouch contains 6 oz. of Gourmet Sweet Muffin Mix (makes approx. 4 muffins). Directions are printed on the back. Personalized labels come unattached from the Muffin Mix.